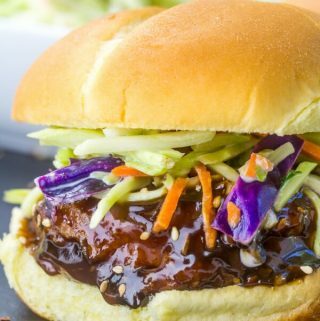 Spicy and sweet with just the perfect amount of bite, these General Tso's Chicken Sandwiches are a fun and easy weeknight dinner that satisfies everyone. In bowl add your broccoli slaw. In smaller bowl combined your mayo, honey, rice vinegar and hoisin sauce and stir until combined. Mix in to your broccoli slaw, cover and refrigerate until ready to serve. To make sauce, in sauce pan combine you sauce ingredients and heat over medium heat until thickened. Dip each chicken patty into sauce until coated and place on bun. Top with slaw and serve.